Vivian Okejeme in this piece highlights the activities of the Presidential Committee on Prisons Reform and Decongestion as 119 inmates regain freedom when the committee visited prisons in Delta and Edo states. It is a well established fact that awaiting trial inmates in the Nigerian Prisons represent 70 percent of the prisons population in the country. It is also worthwhile to highlight that the activities of decongesting the prisons, represent the continuation of long standing effort by the federal government to checkmate the alarming number. To this end, the Presidential Committee on Prisons Reform and Decongestion, has been living up to their mandate by working tirelessly to ensure prisons across the country are decongested. A great number of inmates are serving jail term due to their inability to meet their conditions of release. Many of them committed minor offences but since they could not pay the fines imposed on them by the courts before their release, they continue to languish in prisons. 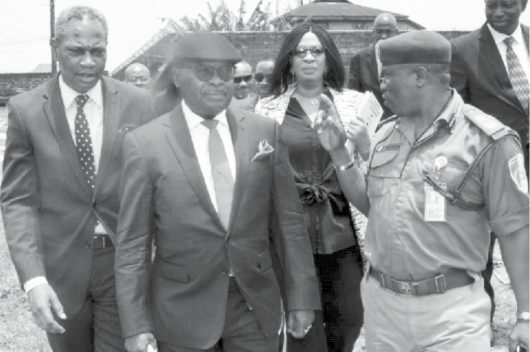 Forth-night ago, the committee, led by its Chairman and the Chief Judge of the Federal Capital Territory (FCT) High Court, Justice Ishaq Bello and the Secretary, Mrs. Leticia Ayoola-Daniels, visited prisons in Delta and Edo states, alongside other members. During the visit of the committee to Delta state, a total of 43 inmates in Warri and Ogwashi Ukwu prisons regained their freedom. The Chairman of the committee, during the prisons decongestion exercise said, “So far, we have covered 13 states of the Federation for on- the-spot assessment of the prisons facilities, inmates convicted for minor offences with option of fines, some special cases and decongest the prisons of inmates who have no need still being incarcerated”. Justice Bello, in his goodwill message during the courtesy call on the Delta State Governor, Senator Ifeanyi Okowa, commended the Attorney-General of the Federation and Minister of Justice, Abubakar Malami’s foresight in inaugurating the Committee on this onerous task and explained the mission of the Committee in line with the Federal Executive Council’s mandate to reform and fast-track the Decongestion of prisons nationwide. He stated that Delta was the 13th State visited by the Committee. The Chairman informed the gathering that international bodies have indicated interest to partner with Nigeria on its skill acquisition program for prisoners. On the issue of inmates who have managed to develop themselves with skills and education while in prison, he urged the Nigerian Government to articulate ways to absorb them back into the society, noting that failure to do so will be precarious because these inmates will be more sophisticated in committing heinous crimes against the society. He buttressed the need for some reforms such as christening the Nigerian Prisons with a new name that symbolises it as a correctional institution. Secondly, the consideration of pardon for those who have managed to advance their educational status while in prison and thirdly, the classification of inmates according to their levels of conviction and detention. For instance, minor offenders and awaiting trial persons ought to be kept separate from condemned convicts. On another note, the Chairman opined that there are two categories of convicts. Firstly, convicts who need rehabilitation for crimes committed such as drug abuse, theft and so on. Secondly, convicts who are of the high political class. The government should rather seize the monies and properties of the latter and sentence them to community service so that the society will see justice at work. The Chairman expressed dissatisfaction regarding some anomalies in the courts that further congest the prisons. For instance, the arbitrary issuance of a remand order by magistrates. Another instance is where some courts have wrongly convicted suspects for an intention to commit an offence. In conclusion, there is need to delineate fine from compensation, hence, no person should continue to remain in prison for failure to pay the later. His Excellency the Executive Governor of Delta State, in his response, said that the office of the Secretary to the State Government has done a lot in the area of prisons reform. He assured the committee of the commitment of the Delta State Government to pay the fines of inmates that will be released in the course of the Committee’s assignment in the state. He stated that the Government is working on expanding the existing skill acquisition programs in the state to enable inmates establish themselves as soon as they exit the prisons. Governor Okowa stated that the reformation of the mind is not only through formal education, hence, the need to explore other alternatives. He agreed that most state governors are reluctant to sign death warrants due to their religious beliefs hence, the need to commute them to life imprisonment. He said regardless of the existing problems in our prisons, the most important thing is that we have started to think of reforms. Among those released on special grounds (health reasons) were a man and his wife who have spent about eight years in Warri prison. The man, Shaka, 78, with one eye totally blind and partially blind in the other who could neither stand nor walk without being aided regained freedom alongside his wife. One of those released from Ogwashi- ukwu prison was Mr. Pender Ossai, 68, who has prostrate cancer and had served a reasonable number of years of his sentence and was said to be of very good behaviour and equally very remorseful. As the train moves on, no fewer than 76 inmates were also lucky to regain their freedom from Edo state prisons. The Chairman in his goodwill message on a courtesy call to His Excellency, the Executive Governor of Edo State, Godwin Obaseki, noted that the plight of the Prisons in Nigeria today is a worrisome situation and part of the task of the committee is to examine cases of those that have options of fine, grounds of ill health/age and cases of those who have over-stayed their prison sentences. He however informed the house that some of these cases are as a result of lapses in adjudicative regimes and attitude. The Chairman also reiterated that there is need to emphasize non custodian sentences and the need to employ probation officers for the Prisons because it is not for the judiciary to impose sentences and also provide probation officers as that is an executive role. The governor in his response said he believes that for us to have a sustainable democracy in Nigeria there is need for reforms in the criminal justice system. He said the Edo state government is doing its best to provide support to the Justice sector in the state, adding that a 50 hectare piece of land has been provided for the establishment of a new correctional facility in the state. He said that the government of Edo state is willing to partner with the Nigerian Prison Service to train prison inmates. A total of 35 cases of minor offences with an option of fine were attended to by the committee after which 33 of them were released. The fines of those released were paid by the Attorney General of the Federation (AGF) and the governor of Edo State. While the inmates were being released, Justice Bello took note of a particular case of an inmate Suleiman Balarabe a 22 years old convict who ran away from his Father in Zaria. The Chairman promised to visit the Father of the convict to get more information as to the circumstances that led to the inmate leaving home. Again, there was also a case of a convict Ahmed Nasiru, an SSCE holder from Nassarawa State, who showed so much interest to go back to school. The Chairman promised to contact the Vice Chancellor of Nassarawa State University to see the possibility of admitting the him into the University. Furthermore, two inmates with Special cases were also released. Omoruyi Stanley a convict with cerebral paralysis was released on compassionate ground after spending a year and nine months from his three years sentence. Matthew Idoko, 71, a paralysis and Diabetic patient was also released. The welfare officer informed the committee that his chances of recovery was slim, the Chairman gave order for his release and for him to be taken to his family in Okada Edo State. There was also an awaiting trial case of Dominic Nduka who has not been taken to court for 11 years after remand. The Chairman frowned at the lapses and lopsidedness of the Magistrate and judicial officers and reiterated that the time of stay of the inmate in prison is enough to make the inmate go into insanity. He further stated that the Committee would make recommendations to the Governor of Edo and Imo State respectively for amnesty for two condemned convicts who have served for 23 years and 19 years respectively but have not been commuted to life imprisonment. At Oko Prison, 19 convicts with options of fine were released. Their fines were paid by the Governor of Edo State and a donor. The Chairman noted a case of an inmate whose offence was “intent to steal”. He said there is no offence in the criminal code like intent to steal. The Chairman informed the judicial officers present that it is a wrong practice and it should be corrected. The inmates were released after their fines were paid by the AGF, Edo state government and a donor. The Chairman of the committee, before allowing the inmates to go home, encouraged them to be responsible citizens and shun hard drugs and crime. He said, “Be ready to live a responsible life when you get back to the society. Be productive to yourself and to your family because you may not be lucky, if you are caught next time”. One of those released, Andrew Obi, had become skilled in the art of shoe-making while in prison and was supported with some funds to assist him start off. Twenty two (22) among the 54 that were released from the Benin prisons also vowed never to go back to their old ways of lives. After a review of the cases, the Chairman observed that there were a high number of cases of inmates with psychosis. In the light of this, he recommended the establishment of Criminal Psychiatric clinics and the employment of psychotherapists across the prison formation nationwide. It is noteworthy that more than 98 percent of those released from prisons are into drugs. They most probably have been under the influence of drugs before carrying out their criminal act. Most of the time, before granting their release, Justice Bello usually asks the inmate to say the truth, if they are into drugs and a great number of them confessed that they take drugs but promised not to go back to it. The point being made here points to the fact that the National Drug Law Enforcement Agency, NDLEA, has a lot of work to do in curbing drug abuse among the youths because most of those in prisons are within the age bracket of 18 to 45 years. To achieved the aim of decongesting our prisons, an effective and accountable mechanism for ensuring that suspects are informed of their right to legal assistance, and for contacting.